Hello, and welcome to Wallonia, the south-eastern part of Belgium. Belgium is a country split in two by a language boundary. In Wallonia, south of this boundary, a Belgian variety of French is spoken, with many regional dialects known as so many forms of Walloon. North of the border, in the Flemish region, people speak a Belgian variety of Dutch, also with many local dialects. The national capital, Brussels, is enclaved within the Flemish region. In a third cultural region, along the German border, German is spoken. In its present state, the Virtourist site will display only a few aspects of the region, but gradually it will expand into a more comprehensive visit in 50 pictures. Please be patient. 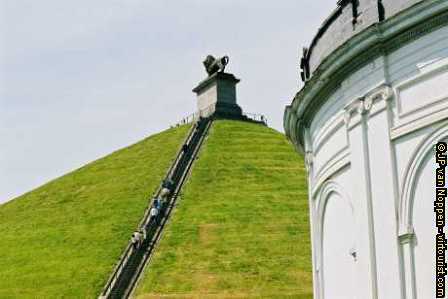 Near Brussels and just south of the language border, Waterloo is the site of the battle where the Anglo-Dutch and Prussian troops defeated Napoleon in 1815. An artificial cone-shaped hill surmounted by a bronze lion has been erected to commemorate the event, and a circular panoramic painting of the battle gives a fair idea of what warfare looked like at the time. The battle caused some 49,000 casualties. Today, the battlefield is traversed by a highway and covered with peaceful fields and meadows, but occasionally, agriculturers will still find pistols and bullets in their furrows.